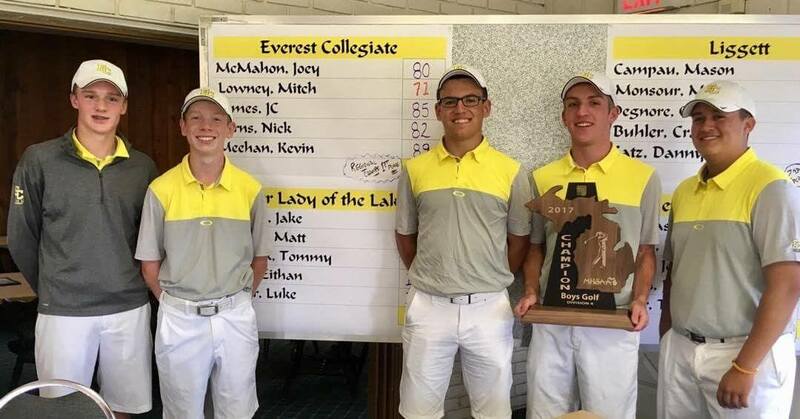 The Everest Mountaineers competed in the MHSAA Division 4 Regionals at Heather Highlands in Holly on June 2. The team shot a 318 to beat the next closest team by 36 strokes. Leading the way for the Mountaineers was Sophomore Mitchell Lowney, the tournament medalist, with a 71 (-1 par). Senior Joey McMahon shot an 80, Junior Nick Korns an 82, Junior JC James an 85, and Sophomore Kevin Meehan an 89. The team will defend their 2016 State Championship this Friday and Saturday at Forest Ackers East in East Lansing .